John Calipari is a smarmy greaseball with a habit of making enemies and racking up NCAA violations, and sometimes I think he's the only man who really understands college basketball. Ask him about one-and-done players, those top recruits who joined him in Memphis and join him in Lexington and spend their mandated two semesters before leaving for fame and fortune in the NBA, and he won't bemoan the practice. He won't mourn for Anthony Davis missing out on three years of dorm beds and cafeteria lunches and the rest of that magical college experience. He won't wish Derrick Rose was only now winning a Rookie of the Year award, instead of being eligible to sign a $95 million contract extension with the Bulls. Calipari's not in the business of trying to legislate the NCAA, only making the most of the rules for himself, his fans, and his players. "There are only two solutions to it: Either I can recruit players who are not as good as the players I'm recruiting or I can try to convince guys that should leave to stay for me." You're old enough now to know the truth. No more fairy stories about "student-athletes" (a tortured phrase Calipari refuses to use) and loyalty and preparing a teenager for manhood. Division I is a minor league and a cattle call for the NBA, and one-and-done only exists because none-and-done no longer does. Save the "shaping young men's characters" bull for John Wooden's condolence book. John Calipari is successful because he recruits the type of player who's going to leave after one season. Win-and-done. Calipari says he could "recruit players who aren't quite as good, who don't have the opportunity" to leave for the NBA. "What I see happening around the country is, you lose players when it's time for these others to step up and be the stars, they're not good enough. And you end up going to the NIT or worse. You go on losing streaks. How will the fans like that here? They like losing? You can't do it." Well, you could, but then you don't get $4.5 million a year. You don't get to be a perennial powerhouse, running deep into March and April and making hundreds of millions for the school in donations from engaged alumni and attracting prep schoolers who want to go where they'll win and be able to show off their skills and not be shamed into postponing their first paydays. It's what Calipari talks about when he refers to his "players-first program," because he gets that everything comes from the players. The success and the fame and the money and the endowments and the reputation, none of that comes without being able to get the type of players Calipari gets. "I could bulldoze 'em, brainwash 'em and make 'em stay. I will never do it. Get another coach. Because if it were my son, I wouldn't want my son treated that way." It's telling that this is somehow a controversial statement. That the man who outright says he's not going to stop a 19-year-old from earning the millions of dollars he's worth is vilified. That Kentucky is referred to as "a trade school for transients," or that terrible human Bobby Knight can claim Calipari is "lacking in integrity" and nobody bats an eye. Yet it's Calipari who thinks that players should receive some kind of reimbursement for their NCAA-enforced lost earning power. It's Calipari who points out that no one criticizes Bill Gates or Steve Jobs for leaving college when it had nothing left to offer them. Calipari's mindset isn't new. Lots of smart people like Taylor Branch and Charles P. Pierce have been beating this drum for years. But what's revolutionary is someone within the system recognizing it for what it is, instead of hiding behind the veneer of idealism. Amateurism has long left the station, and what's left is a crowded waiting room without even a Mussolini to make the trains run on time. Duke, with shaper of men Coach K, lost Austin Rivers after a season. Kansas had three recruits declared academically ineligible this year. Only Calipari doesn't pretend this isn't the cost of doing business. "If we ever won a national title and no player was drafted, I would be excited for our fans, excited for our school and our program, but I'd be disappointed." That's selflessness, and the words of man who's figured out how to build a great basketball team with great players, not student-athletes. Stars come and go. 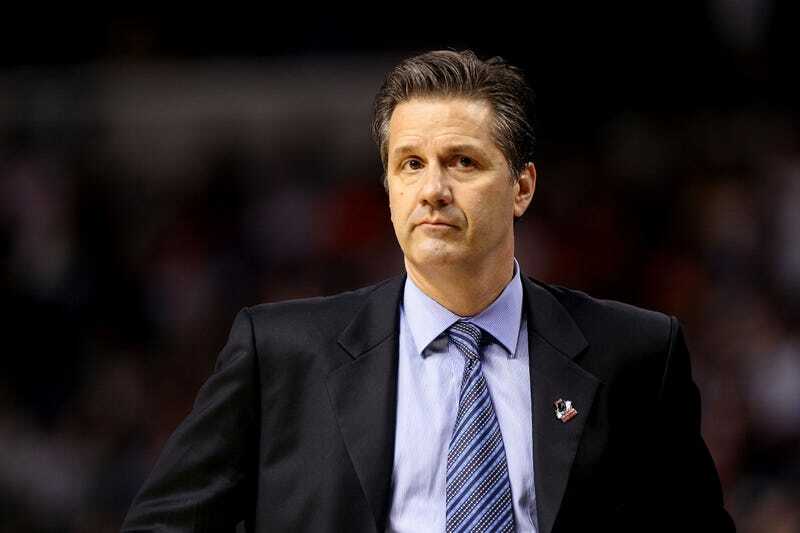 By letting them go, Calipari gets them to come.